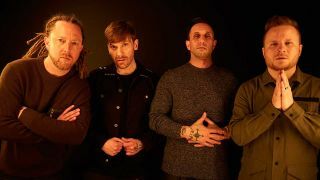 A new study has found that out of all the rock and metal artists who toured in 2018, Shinedown were ahead of the pack. The figures were compiled by Norman Records, who crunched the numbers based on the 1000 most popular artists on Songkick throughout November and December. They then split the figures between different musical genres, with Shinedown leading the charge in the Metal/Alternative category. They played 136 shows in 2018 and travelled 47,470 miles in the process. They were closely followed by P.O.D. and Bullet For My Valentine, while artists including Asking Alexandria, Stone Sour, Judas Priest and Marilyn Manson were also in the top 10. The rock category – which also includes artists from the indie, folk and alernative worlds – was topped by Escape The Fate with 131 gigs played – but they travelled 81,539 miles to do so. The rock list also features artists including Foreigner and Sleeping With Sirens – but, strangely, Def Leppard have been included in the Metal category rather than Rock. The study also found that rock and metal acts were the hardest touring genres last year, with hip-hop, electronic, singer-songwriter and dance rounding out the top 6.